Have you entered to win two FREE product coupons from Coconut Bliss? Enter before 11:59 PM EST tonight! And while you're at it, join the Things I'm Lovin' link up! Today, I want to talk brownies. On the bright side, I have been feeling a lot lighter. A lot happier. Healthier, too. And I definitely think I have lost weight! How much, I'm not sure, but I feel good about it. I have been trying really hard to avoid sweet things, for the most part - I tossed my entire chocolate and sweet stash, which has helped a lot. As my Tone It Up community would say, I have been trying really hard to eat lean, clean, and green! My lines look nothing like those, by the way. But if I continue to lose fat and build muscle, I think I'm on the way to getting more defined oblique lines. Yay! Since joining LA Fitness on Wednesday, a gym near my house, I've been able to get a lot more cardio in than normal. The cardio in Jillian Michaels DVDs only do so much. I run/walk around my neighborhood sometimes, but I like the treadmill at the gym because I can track my progress. My typical gym routine has been 20 min. on the treadmill, 30 min. on the elliptical, and 10 min. on the bike. Recently, I started exploring the arm machines, where I found the "delta fly" machine and fell in love with it. It works my shoulders in the exact area I want to work them! Love. My question for you today: What are your favorite shoulder and tricep workouts? Overall, I feel good about where I am at the halfway point in my 30 days to 130 lbs. I guess we'll see tomorrow how much progress I've really made! Now, on to my second topic: brownies. Obviously, not a diet food, but delicious nonetheless. A week or two ago, I met a lovely woman named Renee. She came to Clifton, where my internship is, to drop off some of her delicious brownies for me to review. 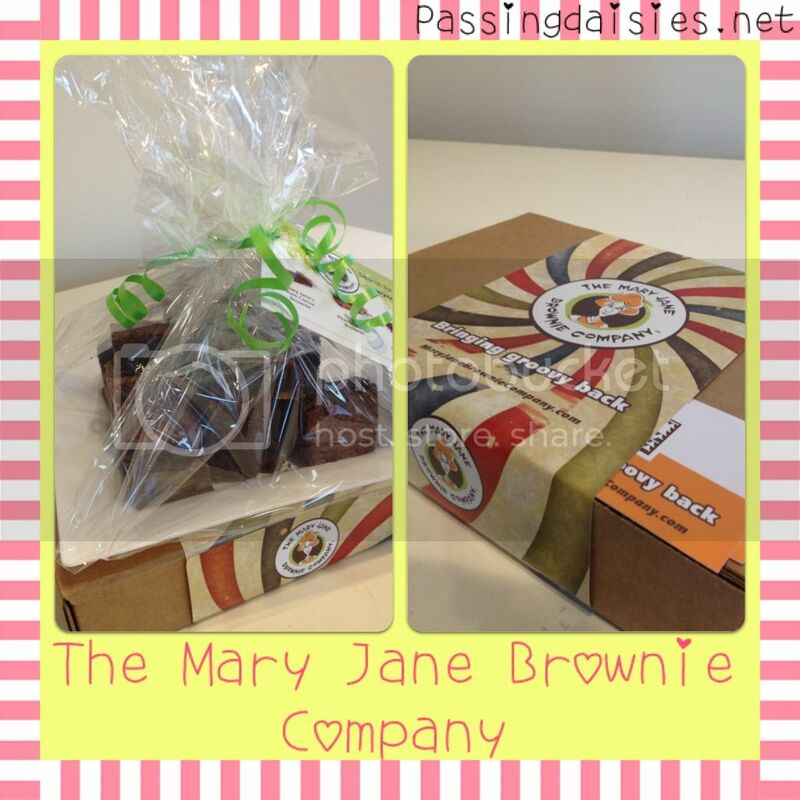 Her company, the Mary Jane Brownie Company, is still very new. The idea for the company was conceived around five years ago, but the company itself is newly launched. The company was named after her mother. They are based out of Cincinnati, OH - gotta love the locals! 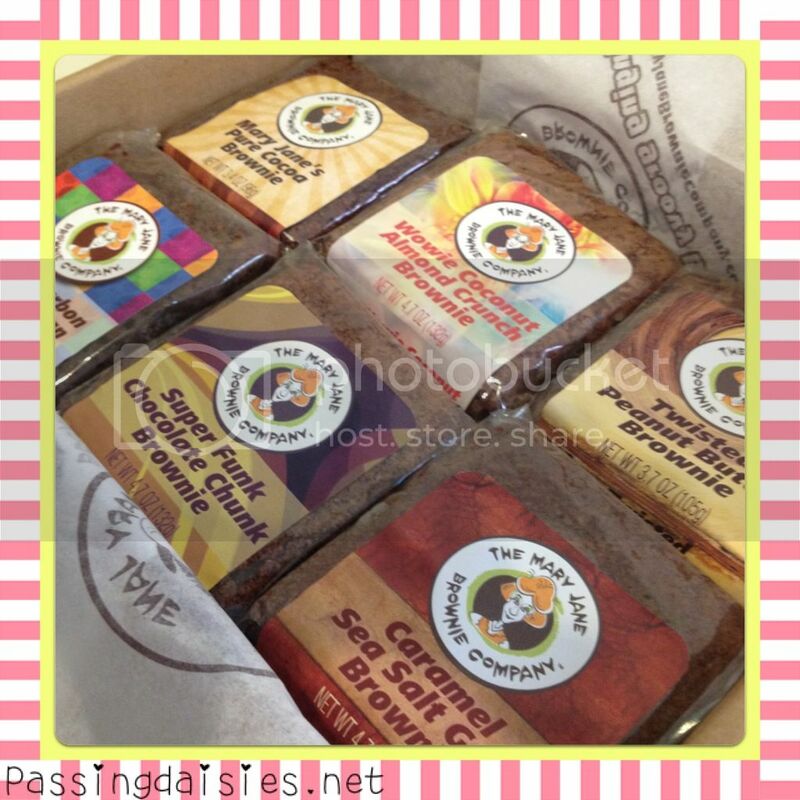 Each brownie is individually wrapped in a certified biodegradable, compostable wrap. They will stay fresh for up to 5 days without refrigeration. Crazy, right? They currently offer six flavors: Pure Cocoa, Twisted Peanut Butter, Super Funk Chocolate Chunk, Wowie Coconut Almond Crunch, Urban Bourbon Caramel Pecan, and Caramel Sea Salt Gold. Lucky me - I got to try them all! Of course, they were all delicious. Mary Jane knows how to make an extremely fudgey and rich brownie - I love them! I was told that the Caramel Sea Salt Gold was the most popular, and for good reason. The caramel was smooth and yummy, a perfect compliment to the rich chocolate. Personal favorites were the Wowie Coconut Almond Crunch - it reminded me of an almond joy bar or girl scout's samoas cookies - and the Twisted Peanut Butter, which tasted like peanut butter fudge with chocolate. The Urban Bourbon Caramel Pecan screamed bourbon when it hit your tastebuds - in a good way! 1. Follow me on Blogger or GFC. 2. Tweet about this giveaway and tag @cityxlights13. Also include a link to the giveaway. One lucky winner will win a box of brownies, mailed right to their house! US residents only, please. No P.O. boxes. GIVEAWAY ENDS WEDNESDAY 7/25 AT 11:59 PM EST. those brownies sound delicious! yum! Mint Oreo Cookie Brownie! Yum! Email subscriber follower and follow you on Blogger too! Thanks so much as these all look divine! Banana peanut butter salted caramel! And I follow you on my google reader, does that count? my dream brownie would be dark chocolate with cherry or cranberry! yum! Tweeted too! Thanks so much as these all look scrumptious! Mocha Coffee Brownie would be delicious! I follow you onBlogger and receive your emails too! Thanks so much! I'm eyeing the Caramel Sea Salt! oh my goodness!! Gooey Coconut Pecan sounds good! My dream flavor would be DARK CHOCOLATE cherry and coconut! New Diet Taps into Pioneering Concept to Help Dieters Get Rid Of 20 Pounds within Just 21 Days!